Central Australia is the home of the road train. The world’s largest and heaviest road-legal vehicles, many exceed 50 metres (165 ft) long and weigh around 200 tonnes. Rolling along at up to 70mph, the 96-wheelers own the road… it takes some skill and a bit of nerve to overtake one. Back in ’95 I was contracted to do a job in the outback Queensland town of Birdsville. It was a 700km dirt-road commute, so with about 160km left to go I decided to stop for a beer in Betoota, which at the time was world’s smallest town. The “town” (I’ve seen it labeled on some world maps) consisted of the Betoota Hotel… and its 85 year-old proprietor, a Polish immigrant known locally as Ziggy. Betoota, Queensland. Formerly the world’s smallest town, population, 1. The old man was a legendary character in those parts. His pub was the front room of his house (the only structure on the 400km stretch between Windorah and Birdsville in the far west of Queensland – 1430km from Brisbane). The Bar of his hotel comfortably seated four. This small building, the two fuel bowsers out the front and some rusty junk out the back comprised his town. The town of Betoota. Ziggy was well known for his fiery temper. If he didn’t like the look of you (which apparently was most of the time) he would refuse to open his door. He was also known to be armed, and was not unacquainted with the western Queensland police, who were occasionally called out to Betoota after altercations between the old man and the ill-prepared outback travelers who dared stop in his town. Rumours were rife about his past during WWII, and whenever some brave (or idiotic) person asked him about this he would generally change the subject or pretend not to understand the question. It was said he used to take down sign posts around his district, and that if (when) tourists complained about his fuel prices he would give them false directions, sending them to an uncertain fate, into the even more remote South Australian desert. I knew none of this when I first stepped through the open door of the Betoota hotel in 1995. A grumpy looking old man looked me up and down and stared at my dreadlocks for an extended moment. He looked through his front window at my vehicle, a turbo-diesel 4WD, with Queensland government markings. The old man shrugged his shoulders, silently pointed to a bar stool and placed a cold bottle of beer on the bar in front of it. I nodded in appreciation, sat down, drank my beer, then nodded again toward the fridge for another. Ziggy started asking me questions, mainly about why a city boy like myself with such stupid long hair would be in a place like this. I told him I lived in the local area (550km East, in Longreach) and that I liked it here in the outback. The old-timer started chatting while I had another couple of beers, and I learned that he’d left Poland during WWII and had been here ever since. Perhaps it was due to his self-imposed exile that he’d retained a thick accent, and I only caught every third or fourth word he said. I nodded and smiled and had another beer while he chatted away. Ziggy didn’t smoke or drink. A police car pulled up outside the pub, which I hadn’t expected (on that road it was usual to encounter another vehicle every hour or so, and usually these were trucks delivering supplies to the outback communities). I grabbed my car-keys off the bar and put them in my pocket, which was entirely pointless. The cop swaggered in and said hi to Ziggy and then to me. He asked if the vehicle parked outside (the only vehicle in town aside from his patrol car) was mine, then sat down beside me before I could answer and told me to hand over my keys. The cop introduced himself, ordered himself a beer and asked me how many I’d had. I lied and said two. He nodded at Ziggy, and another beer was placed in front of me. “There’s a road train coming”, said the policeman. “It’ll be here any moment”. Suddenly spritely, the barkeeper sprang from his chair to the front door, closing it just as the truck rumbled slowly by. The bar went suddenly dark, its windows coated brown in a fine spray of dust. The policeman sitting beside me asked me to tell him about myself, in much the same manner that Ziggy had earlier, and told me to relax because I wouldn’t be going anywhere soon. This did not make me feel relaxed. The dust had cleared when we finished our beers and the cop suggested that it was my shout. I bought another two beers, wondering when, if ever, I would be returned the keys to the brand new government vehicle I’d been charged with the responsibility of. The three of us chatted a while. The cop bought the next round, and I the next. After finishing our drinks the officer looked intently at his watch for slightly longer than seemed necessary… he nodded thoughtfully to himself, and handed me my keys. “You should be alright now. Drive safely – there’s no need to rush,” he said. I was a young man at the time, and those eight or so beers had put me in a bit of a state. I shook hands with the police officer, then with Ziggy, and tried to look sober as I weaved out of the empty little room toward my vehicle, fumbling with my keys, which I dropped… twice. I wish I could remember the name of that cop. He was a nice guy. He told me as I left that he had needed to keep me at the bar because he didn’t trust me not to try to overtake the road train (which was travelling at about 40km/h – I probably would have tried). The thing is, if you’re crazy enough to try overtaking a road train on a dirt road there’s fair chance you will be driving completely blind (see photos above). This is less than ideal even in areas as remote as this. Remembering the police officer’s advice, I did take it quite easy during the final hundred miles of my journey. I happened to catch up with the road train, exactly at the town limit of Birdsville, my destination, where after 700km the dust settled and I finally felt the smoothness of a sealed road. That cop had known precicely what he was doing, and had calculated the timing of my journey to the exact minute. That evening I had a few more beers at the famous Birdsville pub. I told the locals my story and was surprised at their reaction. They were impressed, and said Ziggy must have liked me a lot. I prefer to think I caught the old man on one of his good days. I was fortunate enough to work out there in a few more times, and each time I would stop in to have a beer or three and say hi to Ziggy. The old guy was always nice to me. Betoota, Queensland. Population Ziggy – outback legend (1910-1999). A bit later, in 1998, hundreds of people travelled from hundreds of miles in all directions, for the last call at the Betoota hotel. Ziggy was feeling tired and had decided to call it a day. He closed his pub for the final time, and left it – with its half-full, dusty bottles on the shelves, just as it always had been. Simon Remienko died not long after, aged 89, at a nursing home in Charleville, South-west Queensland. He remains an Aussie outback legend. …doesn’t look like an authentic outback sign. …and of course, in true Aussie outback style, the annual Betoota Cup, the racing carnival which gathers around 500 people each year (more than the population of the entire small-European-country-sized shire). 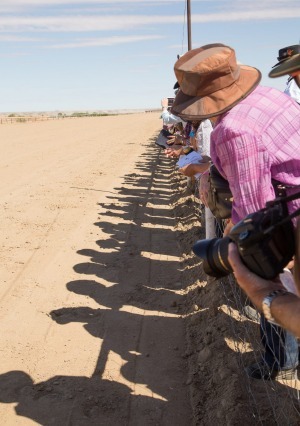 The crowds await the horses on the final straight at the Betoota Race Track. The Aussie outback is rugged, vast and unique in the world, and definitely worth a visit at least once. Like the colourful modern (somewhat out of place) signpost welcoming travelers to Betoota though, the outback is changing just like everywhere else. The old characters like Ziggy, and indeed the pragmatic Queensland cop who got me drunk before sending me on a hundred-mile drive… are dying out. I’d love to travel the outback again one of these days, ideally before it becomes an overly comfortable and sanitised parody of itself… I hope I won’t be too late. Cheers. 40 Comments on "The World’s Smallest Town: A few Beers in Betoota, Outback Australia"
What became of the pub? Did no one pick up the torch from falling hands? Or did they just replace it with a coin operated machine? It would be a shame if no one reopened that place……. Sadly enough Billy, although I haven’t seen any recent photos of the old place, Betoota was left to crumble into ruins. It takes a certain kind of person to want to live alone in an environment as harsh and isolated as that. Diamantina Shire in far-western Queensland is about the size of South Korea (95,000 square kilometers) and has a population of 350. There’s 70km of sealed road. Old Ziggy was one of a kind. Just finished reading a book about DP s / displaced persons from Poland and the brave attempts they made for freedom during WW2 occupation. Vale Ziggy. A great tale and a heart-warming epitaph for Ziggy. The longest truck I’ve ever seen! ..einmal durch einen deutschen Kreisel !!! 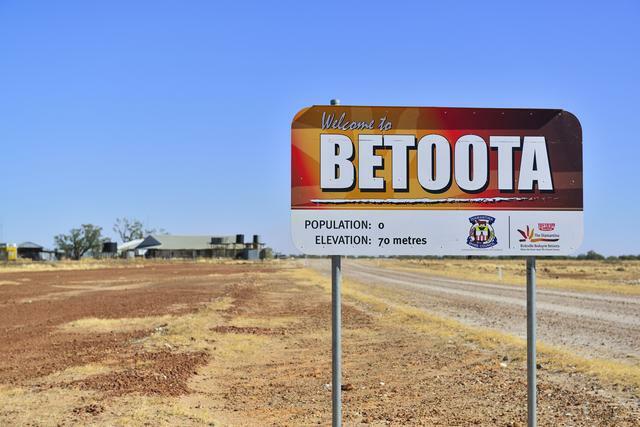 Betoota – aborigine for “shitload of beer “. Past through & had a few beers with Ziggy December 1976 the petrol bowser was an old hand pump unit then . We had a Hilux & 4 bikes it took a few beers worth to fill up. Sorry to hear that Rob. I haven’t been through there since 2000, but from what I’ve heard the vibe does seem to have changed a bit out there. Watch out for this Karen Vind. There’s a load for ya ,Frank Crowdis! Marilyn Habekotté I remember when I first met you ,you had a picture of a road train. I would love to drive one of those! Do they hire foreigners down there? When you see them comming you better step aside. Thanks a lot it is a beautiful one! Good on ya!